A special post for my brother, Eric Deibler, who is considering having a flock of chickens. 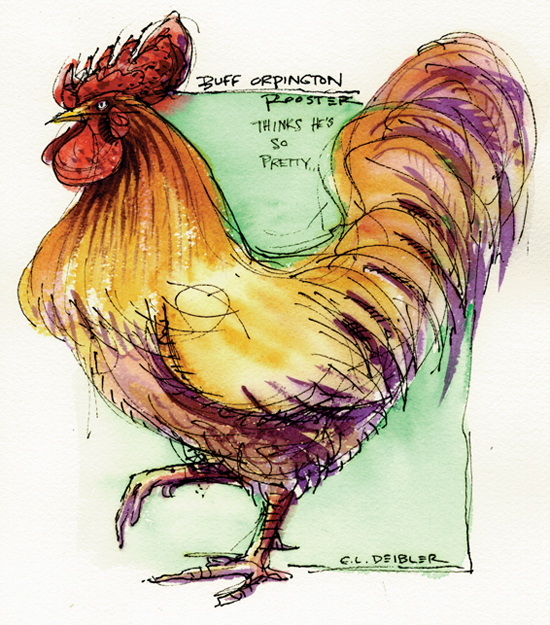 He is thinking about Buff Orpingtons, a heritage breed. "What's a heritage breed" you ask! Sometimes called "rare breeds" or even "antique breeds," these are agricultural animals that are so low in numbers they are considered endangered. They're genetically important, so raise some! A great resource for learning is the American Livestock Breeds Conservancy out of Pittsboro, North Carolina. Visit their website! This beautiful rooster posed pretty well! Painted on site at Kelmscott Farm in Lincolnville, Maine, a haven for rare agricultural breeds.